The forecast is for clouds and possibly rain on Sunday night, so we may move the event to Monday night. If you are planning on coming, please call Sylvia (306)535-1278 on Sunday to get an update. According to NASA meteor expert Bill Cooke, the Perseids are perhaps the most popular meteor shower of the year; and this year, they’ll be the best shower of the year. This year during peak people should see about 60-70 meteors per hour, but in outburst years (such as in 2016) the rate can be between 150-200 meteors an hour. 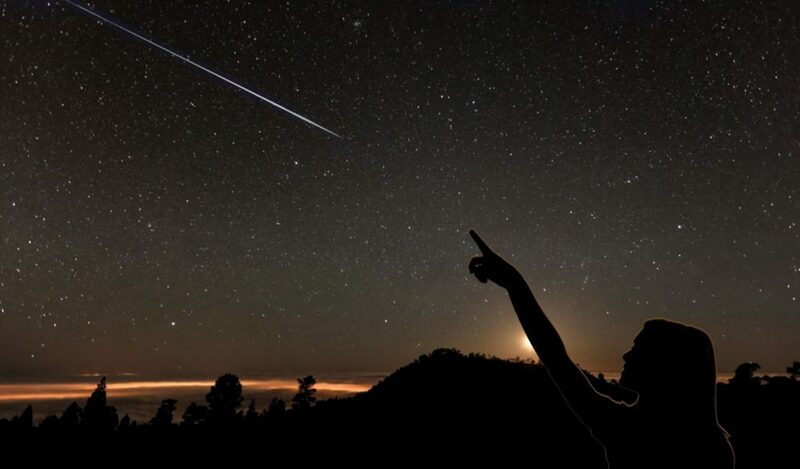 The meteor shower’s peak will be visible the night of Aug. 12-13.
oin us for an exciting night watching the Perseid Meteors! What to bring: Jacket, air mattress, lawn chair, blanket, mosquito spray, pillow, toque(yes, that’s right as it can get cool at night), flashlight. What we offer: Hot chocolate, coffee, tea, wine, soda, popcorn, chips, ice cream. When to arrive: 8pm. No reservations required. When to leave: Anytime before midnight. Other Notes: Please clean up any garbage, there is a complete fire ban, be respectful of your neighbours in terms of sound (keep voices low) and light (keep flashlights pointed at the ground), no outside food or alcohol, no pets, no smoking.